On Saturday evening, we spent a couple hours browsing and shopping during the annual 'Festival of Lights' in downtown Riverside, snapping a few photos -- and finding a few nice surprises along the way. First, it was great to once again see the storefront windows -- decorated and lit up for the holidays -- for the long-shuttered Westbrook's / Imperial Hardware building. We're hoping the windows remain on display following the holidays (possibly for historical/museum displays ... ?). 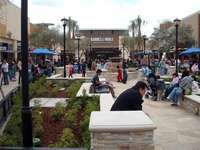 Second, the newly opened 3rd floor for Mission Galleria offered sweeping views of the pedestrian mall below. And finally, it was nice to see fresh art sculptures (one | two) along the pedestrian mall near UCR/California Museum of Photography. We found the newly refurbished pedestrian mall to work quite well with the large crowds, particularly alongside the Mission Inn. The new layout allowed for a larger ice rink and a larger events stage. The Festival of Lights includes an ice rink, carriage rides, carolers, shopping, food, entertainment -- and Santa Claus. Oh, and of course, the centerpiece is the historic Mission Inn decorated with over 3.5 million lights and hundreds of animated displays. The event runs daily (excepting Christmas) through January 3. 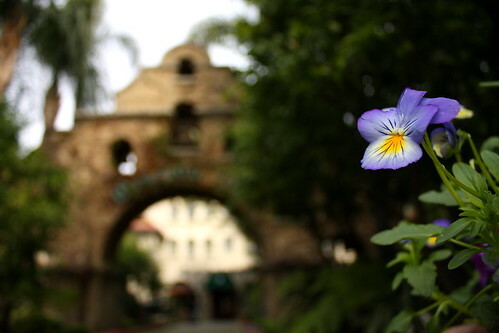 With a hotel as unique and eclectic as the Mission Inn, it's no wonder many actors, artists and writers have found the place invigorating and inspiring. Among them include Will Rogers, Paul Newman, Jack Lemmon, Louis Comfort Tiffany, Zona Gale and Carrie Jacobs Bonds. 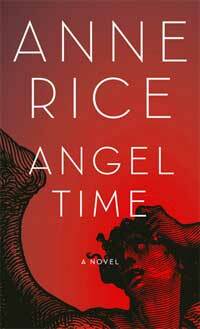 On Saturday, yet another name was added to the list: best-selling author Anne Rice. Rice, who hails from New Orleans but now resides in nearby Rancho Mirage (Palm Springs), first visited the Mission Inn shortly after moving to Southern California in 2006. It was on her first visit to the Inn in which the author says she "fell in love" with the hotel and decided to use it as a setting for her upcoming series. "I just fell in love with the place and I stayed in the Amistad Suite, which they've renamed the Anne Rice suite. So this became a big part of the book for me. And I think loving New Orleans as I do, it was natural for me to fall in love with this place. It has history, it's charming and excessive and all that." "It is the most unique hotel in America. It's a monastery, a museum, a fine hotel, a home, a boardinghouse, a mission, an art gallery and an aviator's shrine. It combines the best features of all of the above. 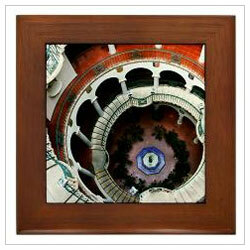 If you are ever in any part of California, don't miss this famous Mission Inn in Riverside." 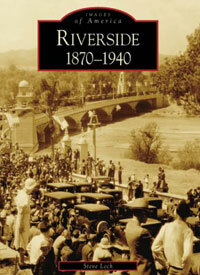 Recently, local historian Hal Durian's weekly "Riverside Recollections" column spotlighted several local history books, including the very popular photo history books from Arcadia Publishing. The Arcadia series includes several topics, including Images of America, Postcard History Series, Then & Now, Black America Series, Images of Sports, and Campus History Series. Locally, several communities have been profiled in the Arcadia series, including: Riverside, Corona, Norco, Jurupa, Rubidoux, Moreno Valley, Hemet, San Jacinto, Menifee, Murrieta, Temecula, Palm Springs, San Bernardino, Redlands, Loma Linda, Montclair, Fontana, Rialto, Colton, Crestline, Lake Arrowhead, and Big Bear. 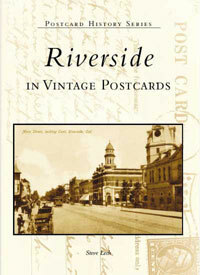 Several cities, such as Riverside, even have multiple books: Riverside 1870-1940, Riverside in Vintage Postcards, Riverside - Then & Now, Riverside's Mission Inn, Riverside's Camp Anza & Arlanza, and Arlington. There are also a number of single-topic books: Norconian Resort, March Air Force Base, Kaiser Steel, Fontana, The Harris' Company, Lake Mathews & Gavilan Hills, and Temecula Wine Country, and Route 66 in California. Beyond the Arcadia books, which offer mostly a cursory review of local history in a quick, easy-to-digest visual format, there are several other local history books of Riverside to take note of. 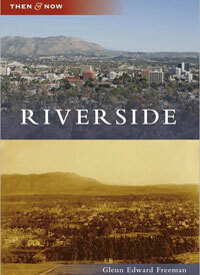 In particular, local author Joan H. Hall has done great work documenting several aspects of Riverside. Her "Adobes, Bungalows and Mansions of Riverside, California - Revisited" (with co-author Esther H. Klotz) and "Cottages, Colonials and Community Places of Riverside California" are two of the best such works, offering insight on many of Riverside's homes, buildings and sites. Hall has also wrote (and/or co-authored) several other important local histories, including "A Citrus Legacy," "Through the Doors of the Mission Inn," "Pursuing Eden," and "History of Citrus in the Riverside Area." 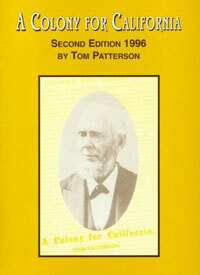 Along with Hall's many books, two other books are worth noting for their more in-depth look at local history: Steve Lech's, "Along the Old Roads -- A History of the Portion of Southern California that Became Riverside County, 1772-1893," which gives background information for communities of Riverside County; and the late Tom Patterson's, "A Colony for California," which is a loose collection of both factual and anecdotal accounts of Riverside's first one hundred years (1870-1970). Most of these books are found at area museums and many local shops, plus Barnes & Noble and Borders bookstores. They can also be found on Amazon.com (click here for direct links to each book). And of course, the Arcadia books can also be found at Arcadia Publishing. 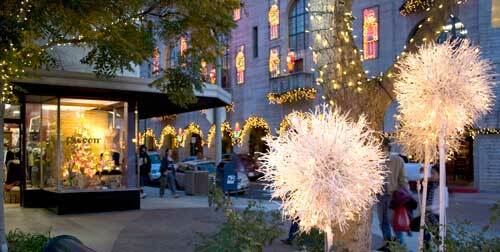 This week marks the beginning of the yearly "Festival of Lights" in downtown Riverside. Every night for 5 weeks between Nov. 27 and Jan. 3 (excepting Christmas), several blocks of the newly refurbished Main Street pedestrian mall come alive for the holidays. The centerpiece of the Festival is the historic Mission Inn hotel, which will again be adorned with over 3.5 million holiday lights and hundreds of animated figures. Along with the lights are an ice rink, carriage rides, carolers, shopping, food, entertainment -- and Santa Claus. Nearby shops and restaurants usually offer extended hours during the festival. Friday, Nov. 27th is the event's official kick-off, which includes a special "switch on" ceremony and fireworks show that begins just after 6:00 p.m. Parking for the nightly event is available in 4 municipal parking garages and on nearby streets (with free parking at all locations after 5 p.m. and all day on the weekends/holidays). What originally began in 1993 as a hotel-only event has since grown to include city sponsorship, spreading to nearby shops and adjacent blocks. It has become one of America's largest holiday light displays. Long-time Riverside photographer, Michael J. Elderman, has spent nearly 3 years photographing the restoration of downtown Riverside's Fox Theater as it transforms into the 1,600 seat Fox Performing Arts Center. Hired by the restoration's project manager to visually capture the massive renovation of the Fox, Elderman soon realized he had the makings for a book. As such, he began planning "Riverside's Fox Theater: An Intimate Portrait," a new, self-published book of his that is expected to become available in mid-December (just in time for January's debut of the new Fox). On Monday night, Nov. 9th, a photographic exhibit based upon the book will open at La Sierra University with a reception at the university's Brandstater Gallery beginning at 6 p.m. In addition to Elderman's exhibit, the reception will include related discussions and presentations. Admission to both the reception and exhibit, which runs through December 10th, is free. 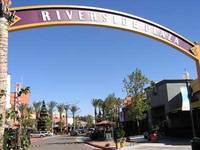 The university is located at 4500 Riverwalk Parkway, about a mile north of the 91 Freeway in southwestern Riverside. In mid-December, Elderman's exhibit will shift to the Riverside Art Museum in downtown Riverside, where Elderman plans to offer the Fox book for sale during a special book signing event. The nearly $30 million renovation of the Fox Theater is part of the city's $1.68 billion "Riverside Renaissance" plan, which includes everything from railroad grade separations and general city infrastructure (roads, sewers, etc.) to new/refurbished parks and cultural amenities. This week found us taking a stroll along downtown's Main Street pedestrian mall during a workday lunch, where we encountered others also taking in the fall-like weather. Further up, we noticed both the main entrance and several windows on the former Westbrook's / Imperial Hardware store are now on display for the first time in several years. They had been boarded up for at least the past decade, if not longer. The sidewalk around the building's foundation has been chipped away in preparation for the pedestrian mall's new surface. It appears a new header has also been put into place. Does this mean the building -- which dates back to 1900, but has sat empty since the 1970s -- is finally about to see a new tenant? 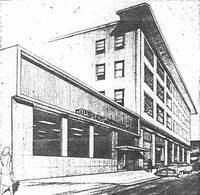 Although Imperial's former false front is no match against Westbrook's 1935 art deco facade, we admit to somewhat missing its mid-century starkness (here's a view from 1967), which covered the building's front from about 1964 until 2007. Regardless, we hope the improvements signal life is once again stirring within the building. The pedestrian mall is expected to be completed in time for this year's "Festival of Lights" on which the months-long work has already started. Color Photo by Luis and Virginia Kay / Columbia Wholesale Supply, N. Hollywood, Calif. 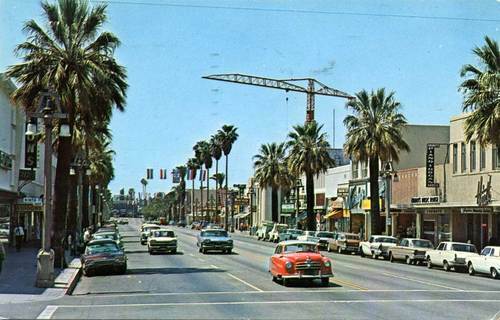 Above is a view of Main Street in downtown Riverside looking south* toward Tenth from Ninth. The view, from approximately 1963/64, is just prior to the construction of the Main Street pedestrian mall (a), which opened in 1966 and stretches north from Tenth to Sixth. At left is Gordon's (here's a different view). According to its sign, Gordon's has been in business since 1905. Just out of view on the immediate left (adjacent to Gordon's) would be F.W. Woolworth. It opened on the SE corner of Ninth and Main in 1940. We're not sure when the store closed, but according to this 1967 view looking north toward Ninth from Tenth (nearly the opposite view of the postcard), it appears to have remained open at least until the late 1960s (here's a close-up view). Back to the postcard ... hanging above the third car on the right is the black & white "Piano & Organ" sign for Cheney's Music. It opened on Main Street in 1944 where it remained until moving in 1970 to the Tyler Mall (now Galleria at Tyler). 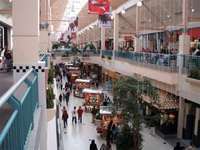 Owned by Warren W. Cheney, the store remained in business at the mall until the early 1980s. A bit farther down on the right can be seen 4001 Main Street (Tenth and Main), which once housed the Security Investment Company (here's a more recent view). 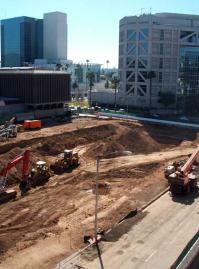 Also seen is the crane used during construction of the 8-story Citizen's/Crocker Bank (c). 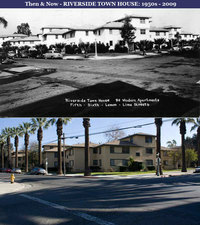 It was downtown's first modern, mid-rise office building when it opened in 1965 (here's a more recent view). Today, if one were to stand in the same location as the postcard, their view would be blocked by City Hall, which replaced the businesses on both sides of the pedestrian mall (Main Street) between Ninth and Tenth streets in 1975. For those interested, here's the back of the postcard, which was mailed to W. Medford, Mass in 1967. 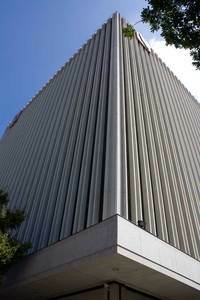 Prior to its 1992 merger with then San Francisco-based Bank of America, Los Angeles-based Security Pacific National Bank had become one of the nation's largest banking institutions. It also had several branches -- and deep roots -- in and around Riverside. ...Citizens has 26 branches (14 are in Riverside County) and $215,000,000 in resources ... (and) has attained an unusual size for a non-metropolitan regional bank and for this reason, and for its progressive policies, it has attracted wide attention in banking circles. Founded by Riverside businessman S.H. Herrick, Citizens Bank of Riverside opened in June 1903 with $50,000 in capital and nearly $15,000 in deposits, this according to a Press-Enterprise report on the bank's 50th anniversary in 1953. Originally located at the northwest corner of Ninth and Main streets in downtown, the bank soon expanded, adding an Arlington branch in 1904. 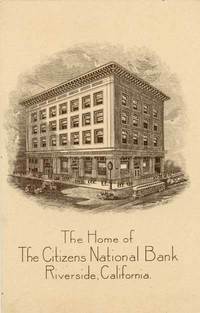 By 1907, shortly after acquiring Riverside-based Orange Growers National Bank and increasing its capital to $150,000, Citizens Bank gained its national charter, becoming Citizens National Bank of Riverside. That same year, Citizens also established a separate bank -- Security Savings Bank -- at the southwest corner of Seventh (now Mission Inn Ave.) and Main streets. This new "savings" affiliate allowed the bank to expand into other lending areas that were restricted by its national charter. Upon acquiring Orange Growers, Citizens moved from its original home at Ninth and Main streets into Orange Growers' much more stately Evans Building located at the northeast corner of Eighth and Main streets. The building -- one of Riverside's most ornate early buildings -- began life in 1891 as Riverside National Bank, which had closed during the national banking panic of 1893. In 1916, Citizens Bank grew again by acquiring First National Bank of Riverside (not to be confused with the long-closed Riverside National Bank from 1891). Upon the acquisition, Citizens again moved into the former bank's much larger, 4-story building located directly across the street at 3800 Main. The move allowed Citizens' affiliate -- Security Savings Bank -- to move from Seventh and Main into the Evans Building, thereby giving Citizens two prime corners of Eighth (now University Ave.) at Main streets. Between 1933 and 1957, Citizens continued growing while acquiring several local banks, including those in the cities of Corona, Hemet, Banning and Apple Valley. 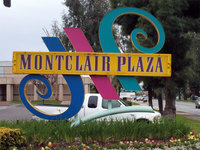 During this time, Citizens also expanded its branch network in Riverside as well as throughout the Inland region, including Barstow, Blythe, Cathedral City, Colton, Fontana, Highland, Loma Linda, March AFB, Palm Springs, Perris, Redlands, Rialto, Rubidoux, San Bernardino, Twentynine Palms and Yucaipa. In the early 1940s, Citizens enlarged its downtown headquarters at Eighth and Main by expanding east along Eighth Street (University Ave.). 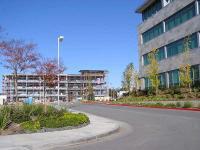 The expansion took place directly behind the bank's 3800 Main Street building on the site of the former Covert Building, which was demolished due to structural issues. Smith said (Citizens) could undoubtedly retain its complete independence indefinitely. But whereas the bank now enjoys cooperation from most large banks of California and elsewhere ... this situation probably will not continue. Having strong allegiance to both Riverside and the Inland region, Mr. Smith was instrumental in making the newly-absorbed Citizens Bank an autonomous division within the much larger Security First National Bank. As such, the Inland branches were known for several years as the Citizens Division of Security First National Bank. In 1958, shortly after the acquisition, the division HQ at 3800 Main Street was remodeled inside and out. The mid-century designs -- ground marble aggregate and Byzantine tiles -- of Los Angeles-based architect Welton-Beckett remain apparent today (one | two | three). Later, after the passing of Smith, the regional branch network continued growing, eventually becoming the Inland Division of Security Pacific National Bank. 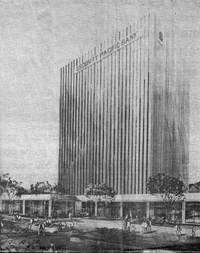 It would move its local headquarters (in 1973) into the aforementioned 11-story bank tower in downtown Riverside, which sat diagonally across the street from the previous headquarters building at 3800 Main Street. Officially known as Security Pacific Plaza, the new building -- and soon-to-be adjacent parking structure -- took up an entire city block on the west side of the Main Street Pedestrian Mall between Seventh Street (now Mission Inn Ave.) and University Avenue. Previously, the block contained several smaller structures, including Riverside's oldest brick building -- the B.D. Burt & Bros. store located at the NW corner of Eighth (now University Ave.) and Main streets. For nearly 20 years thereafter, Security Pacific National Bank grew into the Inland region's primary "national" bank, with its Inland Division playing an important role in local civics and philanthropy. However, in April 1992, both Riverside and the Inland region lost one of its primary corporate operations when Security Pacific National Bank merged into Bank of America. The 1992 merger removed the Security Pacific Bank name from the nation's banking landscape as numerous SPNB and BofA branches were consolidated. In most cases, the SPNB branch closed and accounts were transferred to the nearby BofA branch. In some cases, however, the opposite took place with the SPNB being re-signed as a BofA. Many of the remaining SPNB branches became expansion opportunity for other banks. In 2004, the "security" name returned to Riverside's banking landscape as a new bank, with ties back to the local offices of Security Pacific National Bank, was formed. The bank, which has a similar name -- Security Bank of California -- has its main office in downtown Riverside, with branches in Redlands and San Bernardino. So, the next time you visit your Inland branch of Bank of America, you might just be stepping into a former Security Pacific National Bank branch, which itself, could very well trace its heritage back to Riverside's Citizens National Trust & Savings Bank. * Riverside's Citizens NT&SB bears no relation to a Los Angeles-based bank of the same name that moved into the Riverside region during the early 1960s. That bank, which opened Riverside's first modern, multi-story office tower in 1965 -- an 8-story building located at Eleventh and Main -- eventually became part of the now-defunct Crocker Bank, itself later absorbed into Wells Fargo. Below are recent photos of all nine former Security Pacific National Bank branches within Riverside as listed in a 1979 advertisement from a Greater Riverside Chamber of Commerce publication, three of which are current BofA branches (including the 4601 La Sierra Ave. branch, which was a replacement SPNB branch for 4860 La Sierra Ave.). 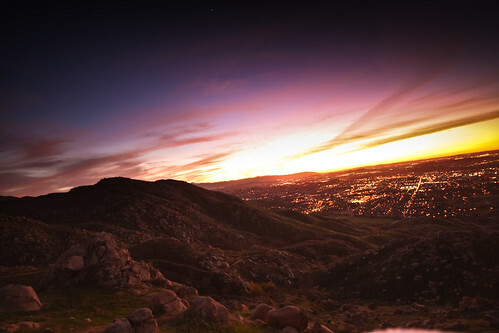 Got a great photo of downtown Riverside or the city in general? Add it to the Raincross Square photo pool. Or view what others have uploaded. After nearly 50 years of printing the Southern California edition of the Wall Street Journal, Dow Jones & Co. has shuttered its Riverside printing facility. Along with the WSJ, the facility has also printed the regional editions of Barron's Weekly and, more recently, the New York Post. The Riverside operation is one of several regional printing facilities recently closed by Dow Jones & Co. as part of restructuring due to decreased print demand and the signing of printing contracts with local newspapers. Other plants shuttered include those in Chicago, Dallas, Denver, Orlando, and Des Moines, IA. Locally, it appears the Los Angeles Times has taken over printing of the regional edition of the WSJ. The Riverside plant began operations in 1961/62. City permits issued in the summer of 1961 show the building comprising 29,542 sq. ft. with an approximate value of $440,000. Its location atop a small hill near Riverside Municipal Airport helped the plant keep a relatively low profile, with many residents vaguely aware of its existence. At one point, Dow Jones -- which became part of Rupert Murdoch's News Corp. media empire in 2007 -- held a minority interest in the Riverside Press-Enterprise newspaper. In 1996, however, Dow Jones sold its 21.5% stake in The Press-Enterprise to Dallas-based Belo Corp., which eventually bought the regional newspaper from its longtime owners, the Hays family, in 1997.
well-manicured Riverside WSJ facility and surrounding land, both of which are reportedly owned by Dow Jones. However, the plant's closing is likely to be felt at Riverside-based Wall's Hauling. The small, family-owned business has delivered the Wall Street Journal -- its largest client -- throughout Southern California since the Riverside facility opened. We know little of the history surrounding the block bounded by Fifth, Sixth, Lemon and Lime streets in downtown Riverside, but a 1948 aerial photo shows the entire lot devoid of development, with grass, shrubbery and some trees as well as a few walking paths. Although it's likely the block once contained at least a few homes, the 1948 aerial gives the impression the lot had recently become an impromptu neighborhood park. In December 1948, however, a building permit was issued for a 96-unit apartment complex, which would encompass the entire block. According to the permit, the applicant (and owner) was Mr. J.J. Goldbach, who listed a McAllister Ave. address in the Arlington area of Riverside. The permit also lists architect William F. Mellin, A.I.A., of 671 "D" Street in San Bernardino. The "Riverside Town House" project, which was given an address of 3489 Sixth Street, was initially valued at $500,000, resulting in permit fees of $292.00. Nearly 60 years later, excepting for the addition of utility lines, the much taller palm trees and a few re-positioned light poles, it appears little else has changed. Probably no other photographer had as much an impact on presenting -- even selling -- Mid-Century Modern architecture than did Julius Shulman, who died Wednesday in Los Angeles. He was 98. Among the many photographs taken by Shulman were projects by the likes of Richard Neutra, Rudolf M. Schindler, Charles Eames, Albert Frey, Pierre Koenig, Eero Saarinen, A. Quincy Jones, John Lautner and Frank Lloyd Wright. Although the majority of his work was in B&W, Shulman's mastery of light, shadows and contrasts invoked a sense of color in his images, many of which showcased the post-war, modern designs emerging throughout Southern California (especially in Los Angeles and Palm Springs -- including the famed Kaufmann House). His perception of angles and scene setting often added a softer human side to the starkness present in MCM designs. 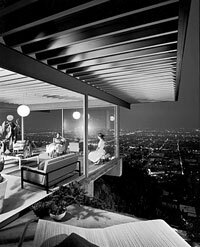 Shulman's most famous photo was that of Pierre Koenig's, glass-walled, "Case Study House #22," (aka, The Stahl House), perched atop the Hollywood Hills overlooking the city lights of Los Angeles. Probably no single image captured the optimistic spirit of the "good life" as promised by America's sleek future as did this one photograph. This past weekend saw the end of an era as Fresno-based Gottschalks closed for good on Sunday. For local folks, this also means an end to what once was the remnants of San Bernardino-based The Harris Co., which operated 7 department stores across Inland Southern California before the chain was sold to Gottschalks in 1998. 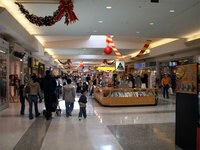 At the Riverside Plaza location, shoppers crowded parts of the first floor to buy merchandise that had been reduced up to 95% in the store's final days. Also up for sale were fixtures and even signage. Other areas of the selling floor had already been stripped bare of most merchandise. The 3-story (plus basement) store will be transformed into a large-format Forever 21, which is expected to open sometime in August. Yet to be made public is exactly how much of the 204,000 sq. 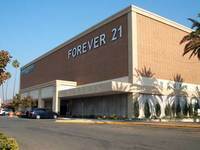 ft. former Gottschalks will be used by Forever 21. It's possible sub-leasing might take place. As for both Gottschalks and Harris', what began in 1904 and 1905 respectively, is now history. The story behind both chains offer similar parallels, each having been founded by newly immigrated German families (Emil Gottschalk and Philip, Herman and Arthur Harris respectively). Although Gottschalks grew much faster as a chain in the post-war years relative to Harris', both chains remained independently owned for many decades, thriving on local control and insights. For Harris', this led to a very loyal customer base, becoming what many considered the Marshall Field's of the Inland region. By 1981, however, the smaller Harris' chain was facing stiffer competition against the larger department stores. 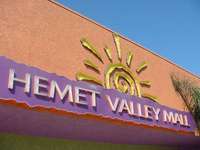 It was at this time that third-generation members of the Harris family decided to sell the Inland Southern California chain to Spanish retailer El Corte Ingles. 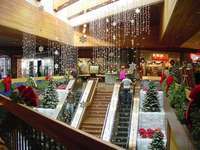 And by the time of their 1998 merger -- in which the 7 local Harris' stores were re-branded as Harris'-Gottschalks -- both chains were beginning to struggle against the national department stores and discount chains. Within 10 years, signs of possible selling off to larger chains began to surface at Gottschalks, none of which managed to fully materialize. 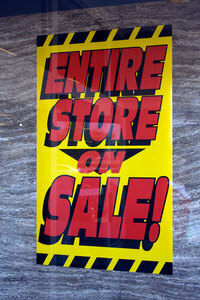 As such, it was a dire economy that finally ended the chain for good as Gottschalks filed for bankruptcy in early 2009. In today's mega-franchise retailing environment, such personalized regional chains are a rarity (and likely to become even more so). And with Sunday's closure of the 58-store Gottschalks chain -- most of which were located in California -- the last remnants of Harris' is no more as well. With an expected completion date later this year, work continues on the $30 million restoration of the historic Fox Theater in downtown Riverside. The renovation of the soon-to-be, 1,600-seat Fox Performing Arts Center includes a complete overhaul of the 1929 theater -- everything from new ventilation systems, theater seats and extensive seismic upgrades to a modern (and larger) stage house. Specialized artisans were hired to replicate the theater's original ornate tiles and painted ceilings. Recently, the city inked a 5-year deal with the Nederlander Organization, which owns/manages nine Broadway theaters and produces several touring shows, some that will now make stops in Riverside. 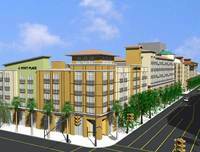 The new entity -- Broadway in Riverside -- joins the company's existing local management groups, Broadway/San Diego and Broadway/LA. 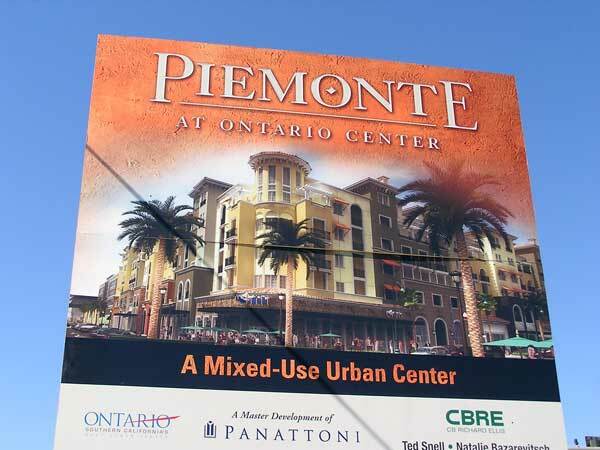 Grand opening festivities are slated for January 2010. Still to be decided is an adjacent, 300/400-space parking garage. The city, which recently acquired the remaining properties, says the garage is vital to the overall success of the Fox project. Unfortunately, the garage means partial (or full) demolition of a few older buildings, most of which contain antique stores (one | two). However, a 1920s-era building on Fairmount Avenue is expected to remain, possibly as a storage house for the Fox. After decades of nearly unfettered sprawl, the time has come to seriously begin changing the basic developmental patterns of Inland Southern California. Gone should be the days of leap-frogging, low-density development. In its place, should come more balance, both in densities and in types. More mid- and high-rise development coupled with higher percentage of business and commercial projects (and less residential). As previously mentioned (one | two), we're not suggesting New York City style mega-density, but pockets of moderate densities -- particularly in downtown Riverside and around Ontario Airport -- similar to those found within the downtowns of Pasadena, Glendale, Santa Monica and Long Beach. If the recent recession has demonstrated any major weakness within Inland Southern California, it's the region's lack of commercial maturity and continued reliance upon warehousing and residential development as its primary form of economic growth. Not only has such dependence created an unbalanced (and unreliable) economic engine, it's left the region with an unbalanced (and wasteful) landscape, one dominated by sprawling development and ever-growing commutes. Quite simply, area residents, builders and government officials alike must begin accepting -- and more importantly, insisting -- on better quality, higher density, more diverse development patterns focused more around jobs and less on housing tracts. Moreover, such future development needs to be coupled with -- and encourage -- alternative transportation, else this region will remain a land of nightmarish commutes. However, amid the hardships of the current economic downturn lies a silver lining. Or better yet, think of it as a golden opportunity. A chance for Inland Southern California to catch its breath, re-focus and begin adding balance back to the region's landscape. Fortunately, a smattering of projects, both built and proposed (some of which are stalled due to the current economic climate) may signal change is afoot. But just as it took several decades to get to where we are today, it will likely take several to re-balance. But without a doubt, the transformation needs to begin sooner rather than later. Thus, the question remains -- will we take advantage of the current slowdown to begin addressing and planning for the region's long-term, sustainable economic and lifestyle needs? We think the clear answer is -- can we afford not to? 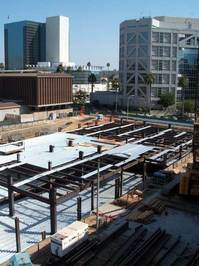 Fifteen months after beginning construction, Regency Tower in downtown Riverside is poised to receive its crown. 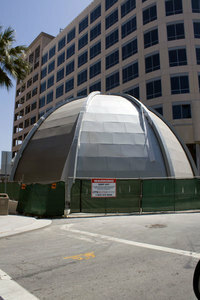 Sitting alongside the under-construction office building is a 45-foot high, 80,000-pound steel and aluminum dome. In about a week, the dome will be perched atop the southwest corner of the 10-story building. Developer Moshe Silagi says a special crane will used to perform the hoist. 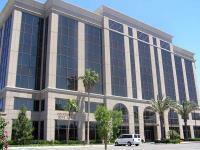 Located at Tenth and Orange streets, Regency Tower was originally developed for the private market. However, the 260,000 sq. 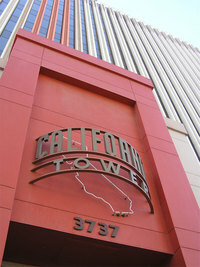 ft. building was purchased late last year by Riverside County in order to consolidate several offices scattered across the city. The county, which said it would have cost more to construct its own from scratch, had been discussing a new building for several years. 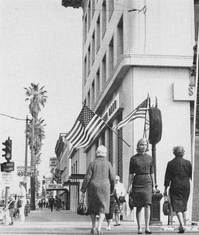 In 1964, after nearly 35 years in downtown Riverside, Sears Roebuck & Co. opened a new, larger "suburban-style" store about 5 miles southwest of its former Main Street store. Though the iconic green Sears script logo, the gas station, the restaurant -- if there ever was one -- and the aroma of freshly-popped popcorn so many of us remember as kids are all long gone, the store itself remains much as it did in 1964, with a ground-level sales floor and full basement. Outside, the exterior sports the classic "California" motif with mid-century facade, flagstone veneer and palm trees sprouting up through the overhangs. This design, seen in several west coast (a) stores built during the 1960s, was a product of Los Angeles-based Charles Luckman (b) & Associates (who also designed the former Broadway (c)/Macy's store at Riverside's Galleria at Tyler). For those interested, Lindgren & Swinnerton was the general contractor for the new store. 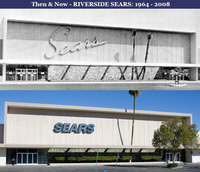 Prior to the Arlington Avenue location, Riverside's first Sears store opened in 1929 near the corner of Fifth and Main streets (near today's Marriott Hotel). Nine years later, on June 2, 1938, a newly-relocated Sears opened at 3700 Main Street. 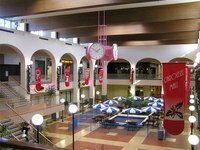 The new store, which replaced the 1890 Rubidoux Building, included two floors, a mezzanine and basement. It also provided "drive-up" service to an automotive center (d) in an adjacent building located at the rear (where Mario's restaurant is today). Enclosed skybridges provided access between the two buildings. 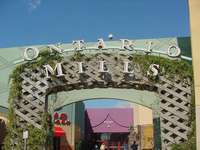 For several years recently, the former Main Street Sears has housed the popular Mission Galleria antiques. It's interesting to note the Arlington Avenue Sears is a bit of an anomaly in Southern California in that it is not located at or near a mall, but in fact is a full-size, stand-alone store. 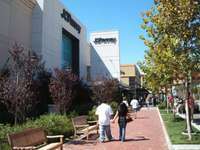 Most SoCal Sears, particularly those built post-1960, anchor malls, including nearby stores in San Bernardino, Montclair and Moreno Valley. 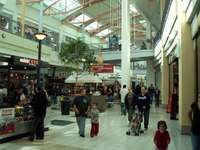 But with the recent announcement of Gottschalks' bankruptcy and liquidation -- which will create a vacancy at the Riverside Plaza -- will Riverside's Sears make the move to a mall? On the heels of last weekend's Downtown Street Jam, the AVP / Crocs Tour "Riverside Open" rolled into town Thursday for a four-day, professional beach volleyball tournament. The event, which is being staged at a temporary "sandbox" and grandstand located at Market and Third streets (near the convention center), is the second stop on the 2009 schedule and the first time the tour has stopped within the Inland region. A total of 3,500 tons of crisp, clean white sand was trucked in to create the 15 volleyball courts. Free parking -- including in the city's downtown parking garages -- will be available after 5 p.m. on Friday and all day on the weekend. 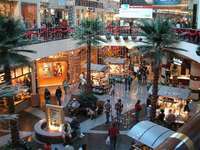 And, of course, food and drinks can be had at the various downtown eateries, restaurants and bars, both on and off the pedestrian mall. Other stops on the Association of Volleyball Professionals (AVP) 2009 tour include Houston, Atlanta, Brooklyn, San Francisco, Chicago, Las Vegas -- and Mason, Ohio, Muskegon, Michigan and Glendale, Arizona. 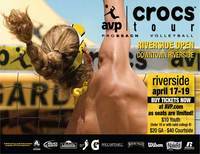 So, grab your shades and sunscreen and head to downtown Riverside for some deep digs, hard spikes -- and bikinis. Sunday, 9:30 a.m. - 5 p.m., with the women's final at 2:30 p.m. and the men's final at 4 p.m.
Tickets are $10-$40 daily or $60-$120 for all sessions. For those who can't make it, check out live AVP coverage for Saturday/Sunday here. 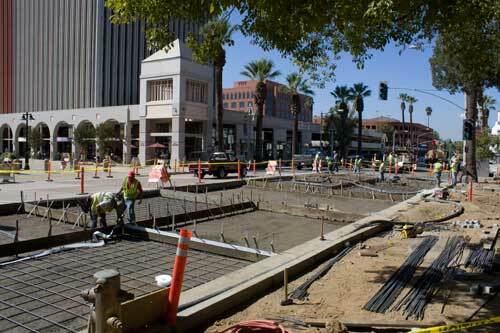 Work began recently on the final phase of the Main Street Pedestrian Mall renovation in downtown Riverside, continuing the first complete refurbishment of the outdoor mall since its 1966* opening. The first phase, which wrapped up in the fall, revamped the two blocks (one | two) located between Tenth Street and University Avenue. 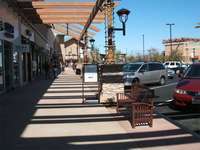 Also included was a partial reopening of Ninth Street through the mall as well as sidewalk and street improvements on Main Street between Fifth and Sixth streets. The current phase encompasses the two blocks between University Avenue and Sixth Street. Crews began removing some trees (one | two) and tearing up the walkway for necessary utility upgrades. Unfortunately, a Corona-based contractor also heavily damaged the 100-year-old "Seth Thomas" clock (photo of damaged clock here). Elite Bobcat Service has agreed to pay for the repairs. We only hope such repairs can be done. At the very least, the city should ensure an equally historic replacement is found. As previously stated, we're a bit unsure how the redo will look in the areas adjacent to the historic Mission Inn, but we do like what we've seen completed thus far. In particular, the look against the backdrop of City Hall is indeed complimentary. Overall, we like the added decorative touches (one | two). However, we do feel the "folding chair" look of the wall seats is a bit odd (no doubt, partly influenced by anti-skateboard measures). But the adjacent electrical outlets -- handy when using laptops on the Wi-Fi enabled mall -- help make up for the somewhat strange seats. Our only real complaint is the new look has caused the mall to lose a bit of character. Although the new lights aren't terrible, we're sad to see the unique raincross lamps gone. The $10 million project is expected to wrap up this summer. 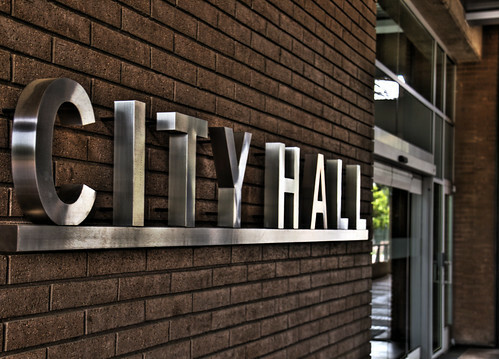 As part of its plans for acquiring necessary land for future buildings, Riverside County is negotiating to purchase two buildings in downtown Riverside. 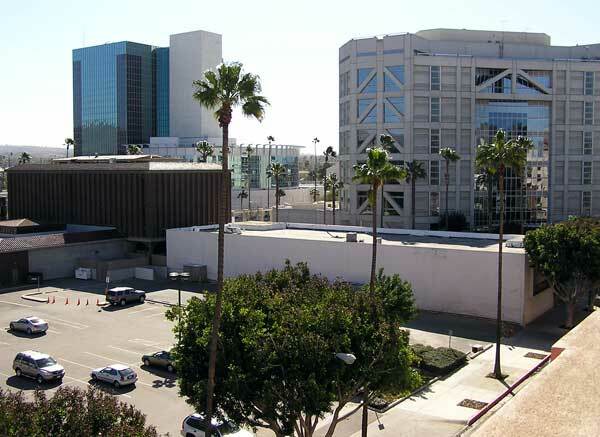 The purchases of the buildings, which opened months apart in 1961, would consolidate county ownership of the block bounded by Main, Orange, Thirteenth and Fourteenth streets. Though no immediate plans have been announced for the site, the long-term fate of the existing buildings -- First American Title Insurance Co. and Mile Square Building -- could be in question. According to statements given to The Press-Enterprise, the county's director of facilities management, Rob Field, says it's not likely the county would tear down the First American Title building, which fronts Fourteenth Street. However, even less assurance was given to the Mile Square Building, which faces Thirteenth Street. Most folks will instantly recognize the First American Title building. Its traditional brick veneer, Colonial-style facade indeed is an instant eye catcher. The building was designed by Riverside architect Dale V. Bragg and constructed by Vern L. Miller of San Bernardino. City permits show the 2-story building at 8,766 sq. ft. (likely per floor) with a cost of $203,000. A 1978 permit shows an additional 7,276 sq. ft. tacked onto the building. Also built by Miller and designed by Bragg is the adjacent and nearly twin-sized Mile Square Building. Though built at the same time as the neighboring Title building, Bragg designed the 2-story Mile Square Building with a sleek modern facade, using a mixture of earth-toned brick veneer and large panes of glass. City permits list the building at 8,850 sq. ft. (again, likely per floor) with a cost of $235,000. In our opinion, the Mile Square Building -- along with the 1960 (former) IBM Building located nearby at 3610 Fourteenth Street -- is a nice representation of the "modernism" style of architecture popular during the 1950s and 1960s. But as with many buildings from this time period, the building -- and the style -- is often overlooked. Though on the surface most folks might disagree, we'd rather see the Mile Square Building retained over the First American Title if only because the former pinpoints a specific period and style of building from America's post-war boom. Although an attractive and distinctive building in its own right, the same cannot be said of the Title building's early-American inspired motif (a style employed by First American Title on many of its buildings elsewhere). Are the buildings worth preserving? For us, much would depend upon what eventually replaces one or both. Simply knocking them down for newer low-rise buildings -- or worse, asphalt parking -- would seem pointless and wasteful. With regards to the Mile Square Building, we'd hate to lose one of Riverside's distinctive 1960s, Mid-Century Modern office buildings. However, as it currently stands, the block is mostly underused and this portion of downtown is indeed best suited for future, large-scale office buildings. Thus, if a "super-block" plan emerges for the site, one which produces a "signature" building, the long-term benefits of such a development could likely sway us. Last Sunday, we had the chance to "ride the rails" at Hunter Hobby Park, one of Riverside's most unique attractions. Located in northeast Riverside, the 40-acre park began life in the late 1950s as an adjunct "backyard" of sorts to local engineer -- and steam train enthusiast -- Joseph L. Hunter, who laid track down for a personal, small gauge steam engine. The track, which was initially 4,300 feet in length, soon began attracting other train enthusiasts. Following the 1965 death of Joseph -- who, along with his brother Edwin, built Hunter Engineering, a pioneer of several key, industry-leading patents in the manufacturing of aluminum products -- the park was donated to the city of Riverside. Not being experts in the area of steam engines, the city set up a partnership with local train enthusiasts -- led by Dr. John Creighton of Riverside -- to maintain the system, while the city maintained the park. Formed in 1966, this all-volunteer group -- Riverside Live Steamers -- immediately began operating, maintaining and expanding the facilities. The club also started providing free rides on selected days each month (currently, the trains operate on the 2nd and 4th Sundays each month). Today, with a track length of approx. 1 1/2 miles consisting of several switchable configurations, the club includes both personal- and city-owned, 7 1/2 gauge (1/8-sized) engines, with the overriding requirement being "steam-only." Recently, the club built a new "car barn" to augment an already impressive workshop facility. On the drawing boards -- as part of the city's Riverside Renaissance Initiative -- are several major park improvements, including a new boarding station, train themed playground and a lake for remote-controlled boats. New restrooms, picnic facilities, a concession stand, expanded parking, tennis and basketball courts and improvements to the nearby ball fields are also part of the plan. So, if you have a couple hours free on an upcoming "run day" Sunday, take a trip to one of the area's most unique attractions for a bit of railroading. 2008 is the previous archive. 2010 is the next archive.